The US detention camp at Guantanamo Bay has come under intense scrutiny since it began to receive foreign detainees in early 2002. The US has faced frequent attacks for holding inmates without trial and for their alleged mistreatment. United Nations human rights investigators have called for the camp's immediate closure. But the US government has been steadfast in its defence of the camp and says inmates are treated humanely. Housed on a naval base in Cuba, the camp was established to hold suspected terrorists captured on the battlefields of Afghanistan. The US defence department says their detention is a matter of security and military necessity in the "war on terror". Pentagon officials insist the US is entitled them to hold "enemy combatants" - who do not enjoy the rights of prisoners of war or US citizens accused of crimes - without charges or trial for the duration of hostilities. Doing so acts as a deterrent and prevents further attacks on the US, they say. 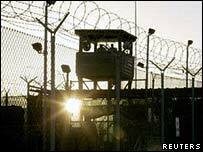 By November 2002, the camp held more than 750 detainees. Since then, hundreds have been either freed or handed over to their national governments. Three detainees committed suicide in June 2006 - the first to succeed in doing so, though there had been earlier suicide attempts at the camp. The camp currently houses about 460 detainees from about 40 countries, and is said to include terrorist suspects picked up in Eastern Europe and Africa. 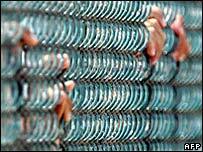 In March 2006, the US defence department released the names and nationalities of the inmates for the first time. It came as a result of a Freedom of Information Act request filed by the Associated Press news agency. Allegations of mistreatment emerged from the start. The International Red Cross is the only organisation that has been granted full access to detainees. However, the UN says it has evidence that torture has taken place at the prison. Its allegations include the force-feeding of hunger strikers through nasal tubes and the simultaneous use of interrogation techniques such as prolonged solitary confinement and exposure to extreme temperatures, noise and light. The UN also says many of the inmates have had mental breakdowns. Detainee representatives have repeatedly complained that inmates have been denied access to a lawyer. In a report in May 2005, the human rights group Amnesty International called the camp "the gulag of our times" and also called for it to be shut down. Last year, a report in the US magazine Newsweek - later retracted - said US guards had flushed a Koran down a toilet, sparking violent anti-US protests worldwide. An FBI memo, reported in the New York Times, described incidents of abuse involving strangulation, beatings and the placing of lit cigarettes into detainees' ears. The Pentagon insists prisoners are treated humanely. It has admitted to five incidents in which the Koran was mishandled by staff at the camp. But the military says only about 10 cases of misconduct by guards have been recorded. Nonetheless, early this year it announced an investigation into the allegations. A separate inquiry was launched in October 2006 after a marine sergeant who visited the camp has said she understood "striking detainees was a common practice". The sergeant said she had overheard a guard describe slamming a detainee's head into a cell door. While there have been no new arrivals since September 2004, the department of defence says it has no plans to close the camp in the foreseeable future. Military officials complain that those who call for the camp's closure fail to see the bigger picture - that many of the detainees are still dangerous and would attack the US if released. The status of the remaining detainees is reviewed every year through a system of military administrative review boards, which recommend whether an inmate should be released or detained further. These will continue indefinitely until all detainees are released, transferred to other governments or charged and tried, a defence official told the BBC. The US says interrogations are yielding useful intelligence, including some from inmates who have been detained for up to two years. So far, 10 inmates have been charged to be tried by a military commission. But Mr Bush's plans to try them were dealt a blow in June 2006 when the US Supreme Court ruled that the president did not have the authority to order the detainees to face military commissions. A law that sets standards for the interrogation and prosecution of foreign terror suspects held by the US was finally passed on 17 October 2006.